A perfect jewel overlooking the sparkling waters of Long Island Sound! Feel your stress melt away as you savor the ocean breezes. Spectacular newly constructed waterfront home with its own private dock in charming Stony Creek. Ready for some adventure on the water? Walk out your front door to your own dock (with ipe decking!) to your boat, kayak, or jet-ski. Or take your tender to your boat moored in the cove to journey down the coast. Enjoy views of the iconic Thimble Islands from every room in the house. Uncompromising attention to detail is evident in all aspects of this home which includes your own private dock. From the moment you enter through the bluestone front porch, you will appreciate the quality construction. The open-concept design beckons you into the living and dining rooms with white-washed oak floors and custom millwork, anchored by the Stony Creek granite and bluestone fireplace. The kitchen is a chefâs dream with stainless steel appliances by Wolf, Sub-Zero, and Bosch, including a six-burner gas stove. For the wine aficionado there is a separate 78-bottle unit, including refrigeration drawers below to store soft drinks, garnishes, or perhaps a wedge of cheese or two. The crown jewel of the kitchen, however, is the stunning Platinum Karzai quartzite topped island, perfect for casual meals or sipping cocktails while chatting with the chef., At the end of the day, retreat to your master bedroom suite with its own balcony overlooking the water. A wall of windows captures the sunrise, the Thimbles, the boats, and the Sound-- tranquility is inevitable! The spa-like master bathroom with mahogany vanity, deep soaking tub, and custom tile will continue the relaxation process. Two more spacious bedrooms with a shared bathroom complete the upstairs rooms. Next, venture out to the generous back deck and patio, an expanse of ipe and bluestone, ideal for entertaining and dining al fresco. Here you will find the garage and the outdoor shower-- mandatory for waterfront living! Next, venture out to the generous back deck and patio, an expanse of ipe and bluestone, ideal for entertaining and dining al fresco. All this luxury is not isolated-- just an easy stroll down Linden Point Road, one of the prettiest streets in town, will bring you to the quaint village of Stony Creek. With its galleries, shops, eateries, and of course beaches, you will be enchanted by all it offers. Whether taking a sunset cruise through the Thimble Islands, a hike through the Trolley Trail with your pups, or grabbing a cup of coffee, thereâs something for everyone. 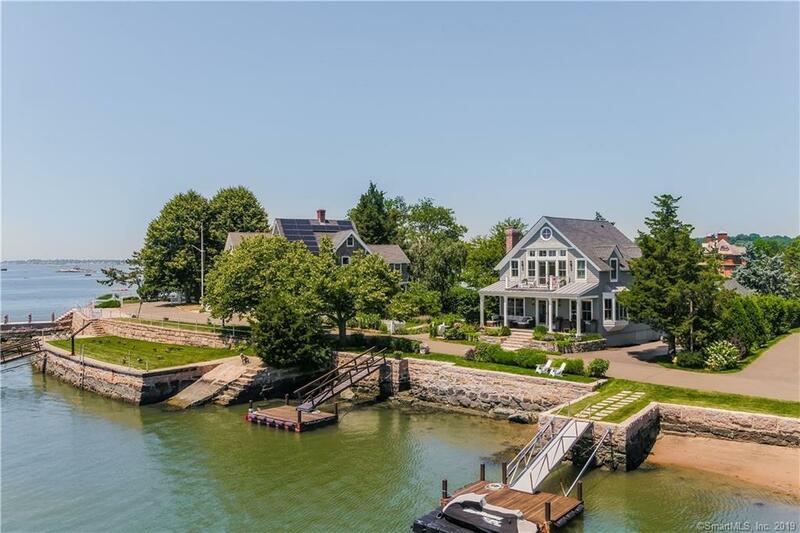 Experience the ultimate in coastal Connecticut living on the beautiful Stony Creek shoreline. Ideally located 15 minutes to downtown New Haven and Yale, 90 miles to NYC. Also comes with 17 Linden Point Road, assessment and taxes reflect both properties.